WHOA! That was an awesome audiobook experience. 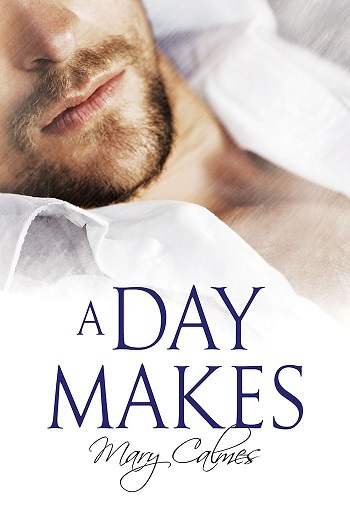 Granted, being as I’ve yet to be disappointed by Calmes’ writing and ad I’m quite enamored with Tremblay’s performances, I expected to enjoy A Day Makes. Buuuut, I didn’t simply enjoy the audiobook, I was sucked in to Ceaton’s story to the point that I lost sleep, unable to turn it off at a decent hour, and then pressing play as soon as I got to work so that I could finish it. I had to know how life as a mob enforcer worked out for Ceaton, if he found the sense of family he was looking for, and if he found someone to love and who would love him back – someone who could look past his job and see the good man inside. Opening the story with Ceaton worried about whether or not he would soon die was one heck of a hook. Seriously. I just met this guy, know practically nothing about him, and I’m worried that he’s about to die – and for all I know, he might deserve to die. But much like Ceaton’s curiosity was piqued by Pravi and Marko, mine was too and I found myself hopping into the car with Ceaton, eager and fearful as to how it would play out. Fortunately for Ceaton, that day turned out to be another pivotal day in his life and he quickly rose up the ranks in the family, demonstrating his loyalty and forging bonds with this new band of brothers – finally finding the family he so badly needed. This is where the author’s wordsmithing is so effective as Calmes moves the story forward over the course of several years, showing the reader important scenes and everyday scenes that illustrate why Ceaton was so good at what he did and why the men at his back, had his back. Yet despite the bonds forged, when life gets sticky for Ceaton – even at the same time as he’s discovered the man he can, maybe, possibly see forever with – he’s not sure who he can he trust and why his loyalty is being questioned to begin with. And this is when the story really kicks into high gear and I was glued to my Kindle, braced for the worst even as I hoped for the best because Ceaton wasn’t the only character whose outcome concerned me. There were moments when I was holding my breath, worried about the plans being made and the bullets flying – I may have even crossed my fingers once or twice. But that ending, ooooooh, that was one unexpected ending. And boy am I glad that I have Late in the Day ready to go because I cannot wait to see what happens next! I’ve already said I’m enamored with Greg Tremblay’s vocal performances and A Day Makes just made my voice-crush even worse. This is not the first audiobook I’ve listened to in which Tremblay performed multiple accents, but the cast of characters with accents was much larger this time and not once did I get confused as to which of the regular characters was speaking. The only time I wasn’t sure as to which character was speaking was when I was expected to be, when a character who’d only been introduced briefly was suddenly taking center stage, and it took a moment for Ceaton to realize who was talking from the other side of the wall – so I couldn’t feel bad for not knowing who it was. Never having heard a Serbian speak (at least that I’m aware of), I cannot comment on the authenticity of the accent, but I can say the subtleties between Marco’s Russian accent and the Serbian accents of the other major characters was impressive and convincing to the untrained ear. And discovering that Tremblay also narrates book two has me ending my review here so that I can dive in because I MUST know more about The Vault. Reviewers on the Wicked Reads Review Team were provided a free audiobook copy of A Day Makes (The Vault #1) by Mary Calmes, narrated by Greg Tremblay to listen to and review.